Most of the people out there carry a false assumption the Kraus to be a brand that does not have an expertise in manufacturing and marketing kitchen faucet. Nevertheless, we quote “They are wrong”; even though Kraus is a young brand, they have an expertise in manufacturing kitchen faucet with a unique combination of traditional, as well as, modern style. The KPF-1622 SN single lever kitchen faucet is the best example. The Kraus KPF-1622SN is a pull down type single lever kitchen faucet that is made of highly durable material and comes at a reasonable price. This product is best suitable for anyone who prefers purchasing a kitchen faucet at a low price, but high durability. The product is made of lead free metal and is guaranteed to provide a maintenance free use. 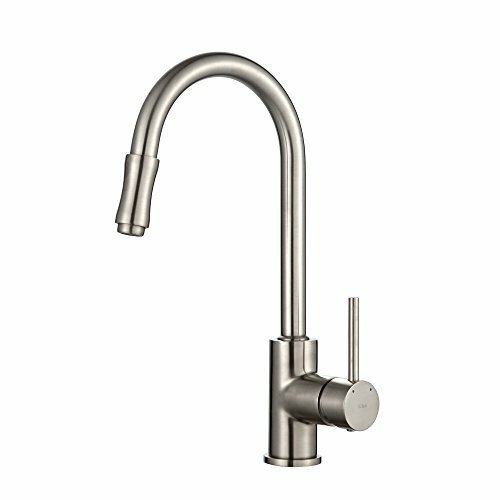 The single lever design makes it one of simplest kitchen faucet out there and offers an enhanced level of flow control. The spout height and reach is set in such a way that it could be used in bigger sinks that are designed to hold many utensils. The high arching swivel spout makes sure that the water reaches almost every giving you maximum control of your water flow and cleaning. The pull down sprayer head is retractable and comes with a counterweight that seems surprising to be incorporated in a product with such a small price. The feature that really surprised us is that this kitchen faucet comes with a NEOPERL aerator that is only found in the high-end kitchen faucets from Kraus. The KPF-1622SN single kitchen faucet comes with several features that most people would not expect in a kitchen faucet that comes at a price this low. The lead free full metal body is one of the most attractive things about this kitchen faucet, the brand has seen to the fact that the metal used is durable and is suitable for lasting long without any change in its color or properties. Yet another important thing is that the manufacturer offers all the required hardware’s with the product so that the user does not have to purchase anything separately. Most of the customer reviews we received mentions that the entire assembling and installing process took only less than an hour which makes this kitchen faucet one of the easy to assemble kitchen faucets out there on the market today. The Kerox ceramic cartridges incorporated into the spout of this kitchen faucet is designed to survive for more than 5 million cycles without any drop in efficiency. The product comes in two colors and finishing, chrome and satin nickel. If you are living in a household with a hard water supply, then, using this product rules out any need of water softeners as the kitchen faucet comes incorporated with rubber nozzles that could prevent the hard water build up easily. With all these features and durability, the Kraus KPF 1622SN single lever pull down kitchen faucet comes to the market with a lifetime warranty on it. The lifetime warranty is not something new that Kraus offers, but for the price at which this kitchen faucet is marketed, the lifetime warrant is surprising and unexpected. The Kraus 1622SN comes tested, certified, and listed by ADA, FTC, SCC, CSA, IAPMO, UPC, and others. Unlike most of the pull down kitchen faucets, do not expect this kitchen faucet to come with the same features. Yes, the KPF 1622SN is a bit different from other kitchen faucets, the pull down spray head do not come with no flow control buttons on it making it difficult to use for people with experience in using kitchen faucet with spray head with flow control buttons. However, the lever incorporated is designed in such a way that it could offer enhanced precision over flow control. Yet another thing that you should know is that before installing the product make sure that there is enough space for the kitchen faucet to swivel 360 degrees without any obstacles in between. If you face any issue while assembling and installing the product, refer the manual that comes with this product. Every detail to troubleshoot your issues will be mentioned in the manual. When it comes to selecting an alternative or a direct competitor for the KPF 1622 SN, there is a surprise, even though this kitchen faucet is cheap there is no competitor for this product on the market today. One of the main reasons for such a scenario is because, the KPF 1622 SN offers enhanced durability and is designed to last long, which most of the products at this price range do not offer. If a product is not durable then, it is not worth recommending. Yet we found a product but not as durable as KPF 1622SN, but comes with flow control buttons on the spray head. Therefore, if you just need that feature and not durability then, consider purchasing Hapilife single lever pull out kitchen faucet. Since the product already comes at a cheap price, the drop in price is not something to be expected in the near future. However, the price might fall if more models are launched and during any holiday sales. One of the main reasons why we recommend this product is because of the durability it offers the price is very reasonable. Yet another reason why we recommend this product is that the lever that comes incorporated into this product is designed in such a way that the user could control the water flow very precisely, this feature is not found in any other kitchen faucet of the same price range. One of the other reasons is that Kraus KPF 1622SN comes with a lifetime warranty, which simply denotes the quality of the product. For a person who is looking for a kitchen faucet that is simple to use, durable, stylish, and cheap at the same time, the Kraus KPF 1622SN is the best option he/she could get from the market today.